I eventually tracked some down in Marks & Spencer where they are called Cantuccini. They seemed quite pricey to me so that started me thinking that perhaps I should put my baking hat on. I looked at various recipes but none produced what I wanted, but with a bit of experimenting, and my wife as the guinea pig, I came up with my version of the recipe for Biscotti or Cantuccini Biscuits. Biscotti can be baked as a plain biscuit for dipping but I think Almonds are the most traditional addition to Biscotti . 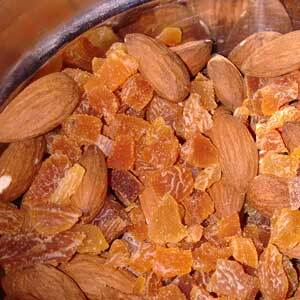 That is the flavour I have tried to capture with adding almonds and by the addition of almond essence and Amaretto. The dried apricots add a little moisture and subtle addition to the flavour. Preheat the oven to 160°C / Gas Mark 3. Prepare a baking tray by covering with baking paper. Whisk together the sugar and eggs until pale and foamy. Sieve the flour and fold into the eggs and sugar. 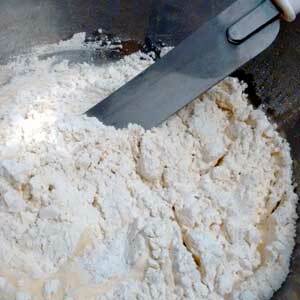 When flour is about three-quarters folded in add the almonds and apricot pieces and mix everything together to form a dough. 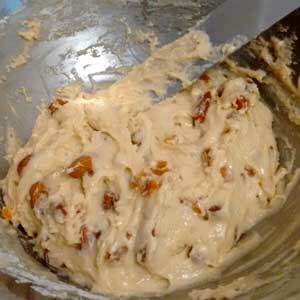 Mix in a good glug of amaretto to the dough. 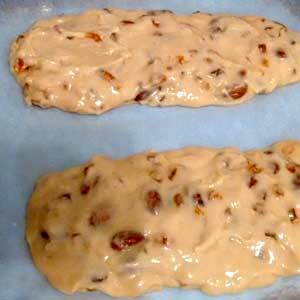 Wet your hands with a little water to stop them sticking to the dough and roll it, in your hands, into two short logs. Place your logs on the baking tray and smooth them out to form two rectangles about 10cm wide. Bake the logs for 30 minutes until golden brown then remove from the oven and leave to cool for 5 minutes. Using a serrated knife, cut the logs into 2cm slices then lay the slices on the baking tray and return to the oven for 20 minutes until thoroughly dried. This is my version of an age old recipe when the biscuits were baked like this so that they would keep without going off. When I bake them they do not have time to go off! You can of course create your own version of Biscotti by changing the type of nuts used and / or the fruit used.